This week, we have a look at AR related patents from Facebook, Microsoft and Apple, Intel releases a new RealSense camera that sounds pretty cool, Amazon joins the ZigBee Alliance board of directors and more! The Intel RealSense Tracking Camera T265 provides six degrees of freedom inside-out tracking using a mix of visual inertial odometry (VIO) and simultaneous localization and mapping (SLAM), which Intel calls “V-SLAM”. It could be super cool to try out! Google and a Boston theater company are aiming to bring a new era of theatre! At some stages of this VR experience, you consume real food and drinks prepared by Mark Garston and Chef Michele Stanco, former team members of Heston Blumenthal’s Fat Duck Group. Vive is in the lead, but Quest has a very impressive showing as it is only dev kits at the moment. “New Reality Company’s Tree puts you into the Amazon from the point of view of a kapok tree”. Linden Labs are looking to expand their live ticketed event offerings this year. 360 Rumors looks at Live Planet’s 3D 360 camera with live streaming and realtime stitching. VRScout asks — are we getting closer to affordable, good-looking AR wearables? The answer, I think, is yes. North’s Focals headset looks pretty darn cool and it’s started shipping! There’ll be a few more pop-up stores available too. It’ll be able to determine the directional location of connected devices with accuracy to the centimeter (GPS can only manage to within 4.9 meters). A nice discussion on how our infrastructure will need to develop to be ready for our AR glasses filled world. More signs we’ll have smaller, lighter and more powerful headsets soon. The DIY headset from Leap Motion has an upgraded design! Karl Guttag has a pretty thorough look at the AR headsets from CES. 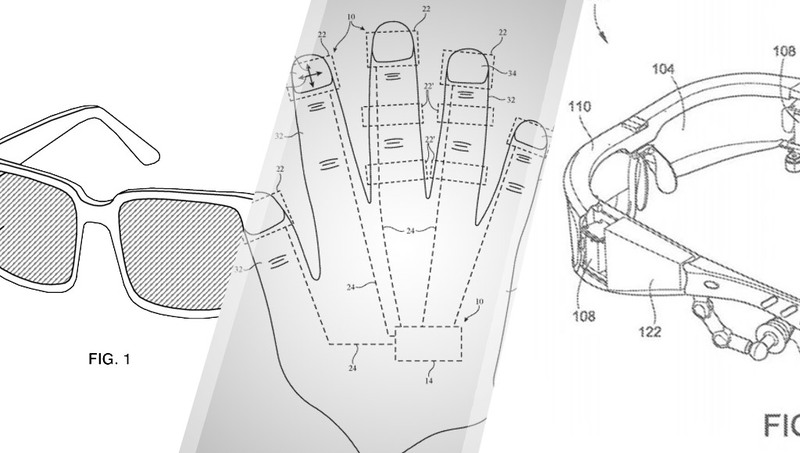 Fast Company has a nice look at Apple’s finger controller patent and how it fits into their growing AR ambitions. Allegorithmic makes Substance — one of the big tools for 3D painting and texturing. It’ll become part of the Adobe Creative Cloud suite. “Researchers have developed a new approach to multicolor holography that could be used to make 3D color displays for augmented reality glasses, smartphones or heads-up displays without any bulky optical components”. Blippar is on its way back from administration after previous investor Candy Ventures completed a successful bid to acquire them. “European Space Agency astronaut Luca Parmitano took to Twitter to show himself and fellow crew member Andrew Morgan (representing NASA) using the Magic Leap One to train an upcoming mission”. Powering wearables is tough, which makes this option pretty darn genius. Here are some predictions from Wareable. The Samsung Galaxy Sport looks to be nearing release. Week long battery life is a wonderful thing. It recognises the food in your hand and tells you how to properly throw it away — great idea! They say it demonstrates how language emerges among groups of users. It works by not only learning how to do the task but how the data supporting its task is structured. They’ve launched a challenge to push the limits of game AI to the next level! Here’s what AI thinks you should sit on. This AR app shows “how machines can aid human workers, rather than replace them”. An off-the-shelf 4 wheel drive chassis added to an Arduino brings some pretty darn cool results. This could indeed save lives if it works. Hello speech, we love you too. wit.AI has announced improvements to their speech recognition technology! If you’ve been wondering how to host your skills somewhere, you can now host it all through Amazon easily and simply. It tunes robotic prosthetics automatically reducing the time technicians have to spend adjusting them manually. If you’re into machine learning, this could be worth a look. Researchers have made the first soft robot mimicking plant tendrils. I, for one, look forward to my Alexa powered squid bot overlord in the near future. A pair of robot submarines have been exploring the depths for a year now doing what humans don’t want to. Abnormal chest X-rays with critical findings will receive an expert radiologist opinion sooner as AI spots the crucial ones. This could be a big deal as it means Amazon will have a much bigger influence on how ZigBee develops from here. I love this and need some for my house. It’s both functional and has character! Also known in some circles as a cheese toastie – a curious DIY project! “Here’s a neat trick for your next 3D-printer build or retrofit: a Z-axis sensor using a DIY strain gauge made from SMD resistors”. Raspberry Pi have a new Compute Module and Hackster have their thoughts on it here. The Japanese government wants to secure IoT devices before the Tokyo 2020 Olympics and want to be able to run tests on IoT devices to find vulnerabilities. “Studying how tree frogs regulate their communications, so each amphibian in the colony can hear everything, could provide ideal data traffic routings, scientists say”. The version of Ubuntu for IoT has a bunch of security updates. This looks like a whole lot of fun. Good way to end the newsletter I think.